The debut of the Gemini 2000 bath at a Kidz to Adultz event has generated significant interest from healthcare professionals and parents seeking a future-proofed assisted bathing solution. The Abacus Specialist Bathroom Solutions stand at Kidz to Adultz Middle received healthy numbers of visitors at the Ricoh Arena, Coventry. Attendees were drawn to the stand to understand more about this latest specialist bathing innovation which provides accessibility for both disabled children and adults. The two-metre long Gemini 2000 is the largest and longest specialist bath available with variable height functionality and an integrated platform. Its generous bathing capacity ensures space appropriate bathing for disabled children as they develop and grow into adults – ensuring safety and postural comfort. Its hi-lo powered movement provides safe working heights for carers as excessive bending can be avoided when providing personal care. The platform reduces awkward transfers, especially when the bather is wet, and allows users to remain warmer through a faster drying and changing process. To maximise wellness for both bather and carer, the Gemini 2000 also incorporates pioneering BioCote antimicrobial technology which protects against Influenza H1N1, E.coli, Salmonella and antibiotic resistant MRSA. Integrated during the manufacturing process, invisible silver-ions cannot be wiped or worn away hence providing 99.9%, 24/7 protection. 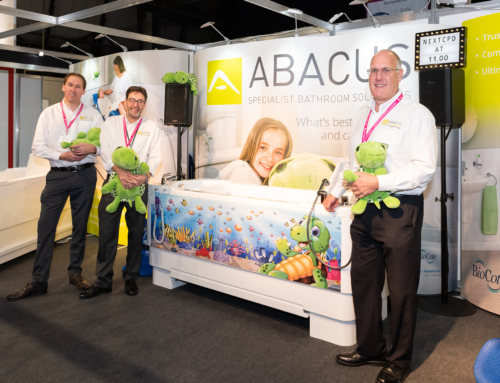 Visitors were given live demonstrations of the bath by trusted product advisors from Abacus. Occupational Therapists, parents and children were able to sit in the bath so they could experience first-hand the comfort the Gemini 2000 provides. The Abacus team also explained the comprehensive support services they provide from initial assessment through to bathroom design, installation and servicing. A selection of engaging case studies was available which demonstrated why Abacus is a proven and trusted specialist in accessible bathing. Alongside the product showcase, Abacus delivered an educational seminar at Kidz Middle in association with The OT Service. Kate Sheehan, a highly experienced Occupational Therapist with over 30 years of experience, delivering a CPD-accredited assisted bathing seminar entitled: ‘Bathing – a right to play’. This session explored “play” as an occupation and considered how legislation and clinical reasoning can be used to support the necessity of a bath in the funding process. The OT Service is a key partner of Abacus ‘Lunch and Learn’ and ‘CPD Assisted Bathing Workshops’ which provide free assisted bathing education and training for healthcare professionals.